As your fellow beauty junkie, I thought I’d share the products I’ve currently been lusting over with you all today! I don’t know if I’ll end up purchasing all of them as it would make quite a dent in my bank account, but we can all dream right?! Space NK is one of my favourite places to shop for beauty as they really take the time to pick out and stock some truly amazing brands. 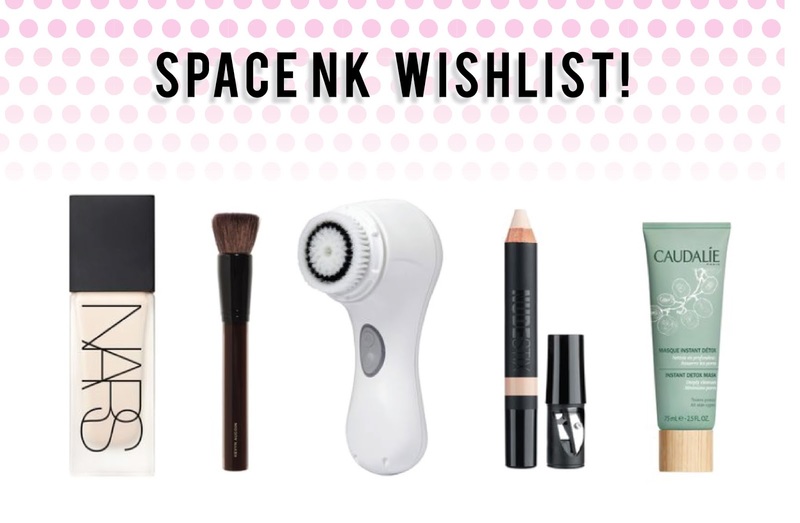 Unfortunately I don’t stay near a Space NK store so a lot of my shopping is done online, but its still a great experience overall. Lets get down to business..
1. Nars All Day Luminous Weightless Foundation – I hear a lot mixed things about this foundation and so many people tried this when it first launched. From the reviews I’ve read I think it’ll be great on my oilier skin type and provide me with some nice full coverage without looking heavy. Obviously I cant say until I’ve tried it but I have high hopes if the day comes! 2. Kevyn Aucoin Super Soft Buff Powder Brush – I felt this brush when I last visited a Space NK store and it was the softest brush ever! I think it would work amazing for powder or liquid foundation as it has a really nice density to the bristles. It has a pretty steep price tag at £48 but I imagine its worth every penny. 3. Clarisonic Mia 2 – I’ve wanted to try the Clarisonic for so long and I think I might end up treating myself to this at the end of the month as I really want to get into better skincare habbits! 4. Nudestix Skin Concealer Pencil – This is another brand thats been getting quite a lot of love recently, and the idea is that your entire makeup bag is pretty much made of pencil form products. I don’t know if this idea is something I could fully commit to but I think a stick form concealer would be a good place to start! 5. Caudalie Instant Detox Mask – As someone who fights with clogged pores on a regular basis I’m always keen to try new masks and products to help battle this! Caudalie is a lovely brand and all the other skincare bits I’ve tried from them have really went down well with my skin so I think I’d get on quite nicely with this mask! Thats it for my wishlist today, I hope you enjoyed reading this post and maybe I’ll do more like it soon! Wheres your favourite place to shop for beauty? Have you been eyeing up anything lately?